But we were finished with four. Can you see her counting us at the end? 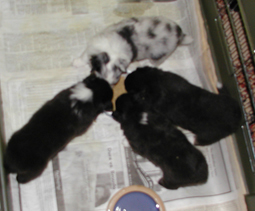 So here we are at two days old, a tricolor girl and a blue merle girl in the middle with two tricolor boys on either side. 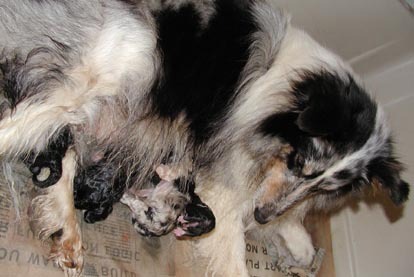 Our first story is that we were born on the day our human mother retired from dialysis nursing (She actually went to work AFTER we were born). Because of that we have the names of the wonderful people Kit worked with. 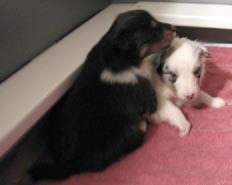 First born (on the right) was the dark tricolor named Opie. 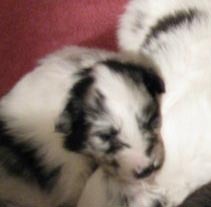 He started crying when the blue merle girl Mara arrived (which woke Kit up and got her helping). 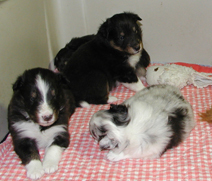 Next came the flashy tricolor Nick (on the left). 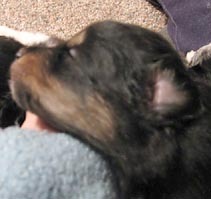 Last was the tricolor girl Cindy who had to struggle in the beginning but is feeling much better now. 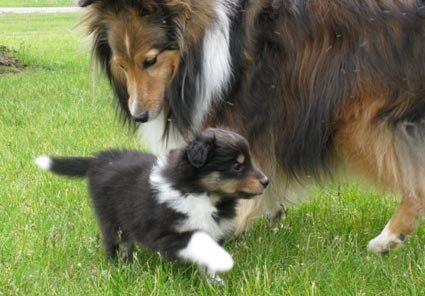 We have something to tell you about our pedigree and some Sheltie history. 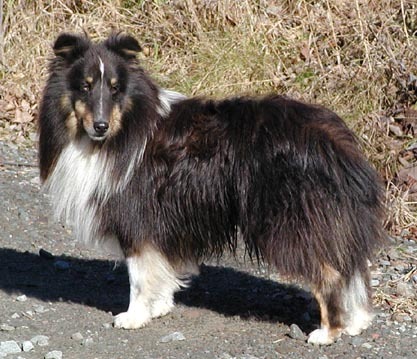 If you read the Black Angie page you will recall that Kit started out in the 1960's which means she was using Shelties from the 1950's. 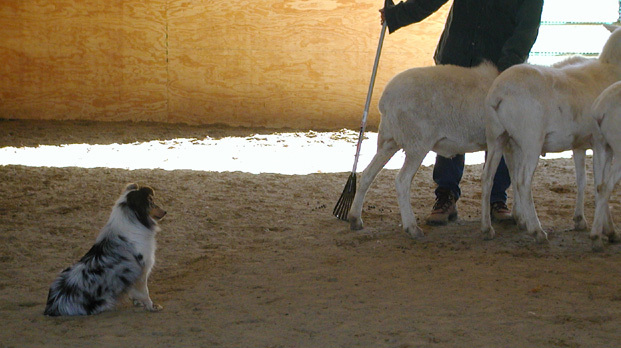 At that time two leading kennels (which Kit admired) were Sea Isle and Pocono. A major Sea Isle stud was Ch.Nashcrest Golden Note (the sire of Ch.Sea Isle Serenade behind Calcurt) and a major Pocono stud was Ch. Shelt-E-Ain Reflection O'Knight (the sire of Ch.Blue Heritage of Pocono behind Calcurt). Notice the comparative pedigrees which shows the relationship of these two foundation studs. This was taken from an old ASSA Stud Catalog so not very clear. But if you study you will notice that Note's mother and Reflection's father were full brother and sister. 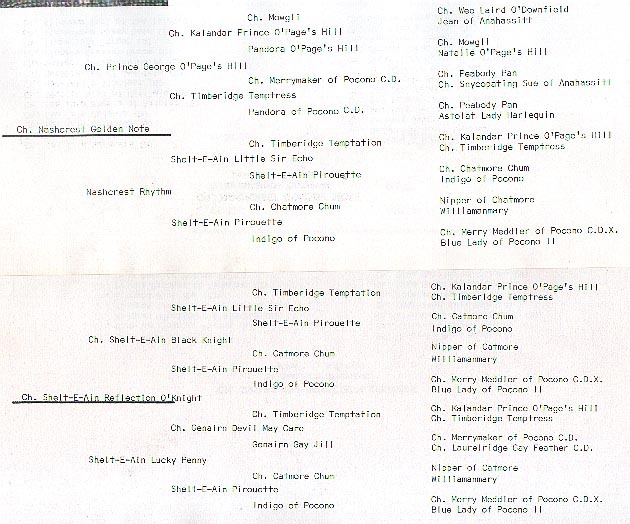 So Ch.Shelt-E-Ain Black Knight and Nashcrest Rhythm were both produced by Tobi Ain (Kit's role model). 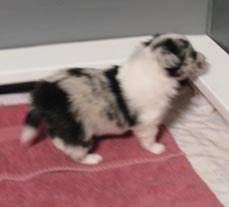 Tobi's formula appears to be this: obtain a quality female (Indigo of Pocono). 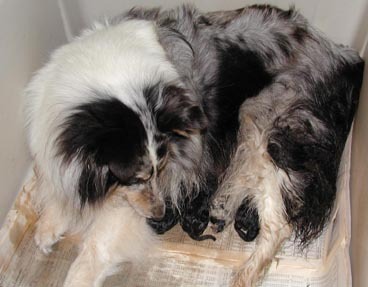 Breed her well and keep the best female (Shelt-E-Ain Pirouette). 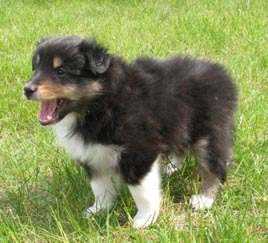 Breed that female to an outstanding sire (Ch.Timberidge Temptation) and keep the best son (Shelt-E-Ain Little Sir Echo). 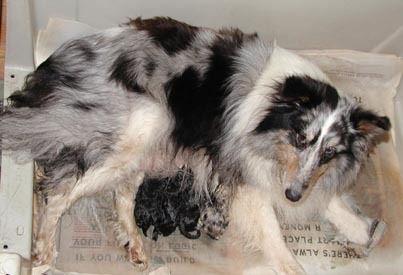 The final step was to breed that quality boy back to his mother. Such is the secret of our pedigree: Calcurt Fawnwood Black Magic bred to Ch.Macdega Asterisk, ROM produced Calcurt Silver Sorceress who was bred to Ch.Virgo Tommy Tune to produce her son Calcurt The Dark Force. 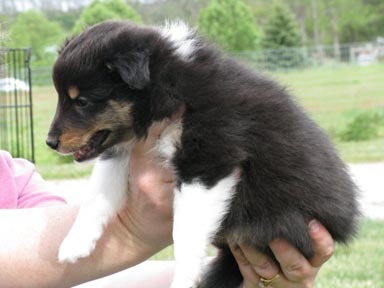 And now Sassy was bred to Vader for our pedigree so check it out. And while you're at it check out our other siblings by Falcon. Which son is the best? Maybe both have something to offer. We may not become a Black Knight or a Rhythm, but it will be interesting to see how we develop. 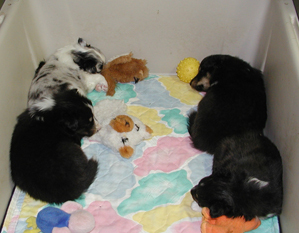 At one week we just like to hang out with Cindy,Nick,Mara and Opie or Mara and Cindy beside Nick and Opie. Can you tell who is who? 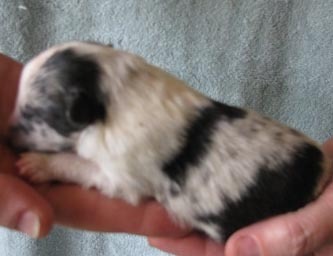 By three weeks we are beginning to get into the larger world. And we are starting to eat "real" food. That's Mara on top with Nick, Cindy and Opie below. Then Nick looks at you with Cindy hidden behind Opie and Mara sound asleep. 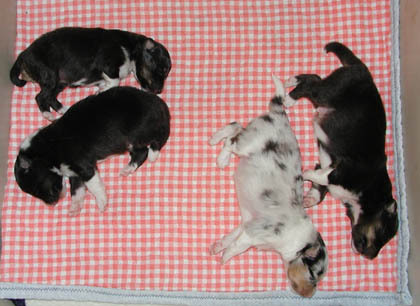 Finally you see Opie and Mara in the middle with Nick above (head up) and Cindy below (curled up). Aren't we starting to look more like little dogs? At four weeks we begin to fill out our home. 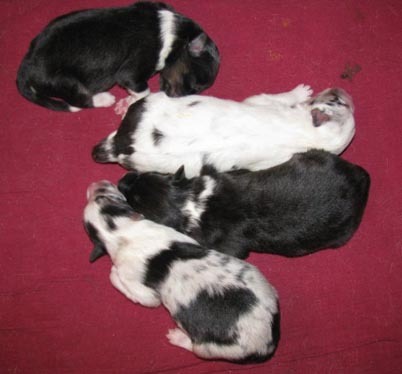 That's Mara over Nick on the left and Opie over Cindy on the right. We still do a lot of sleeping but our next step will be outside time. And here it is, four weeks (almost a month). Do you recognize us yet? It is Nick Opie Mara and Cindy in the first shot and Opie Nick Cindy and Mara in the second. 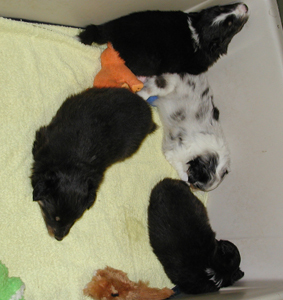 We're on our feet and starting on solid food. Before you know it we go to our forever homes. 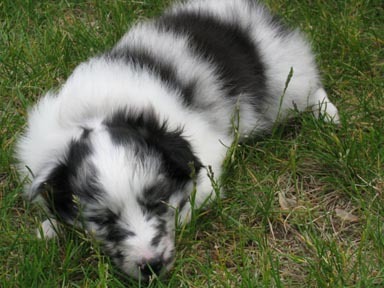 Mara has grown up to be called Daisy and featured on our Calcurts At Work page. Her sister Cindy now called Echo is working with Lynn Thomas featured on the same page with Calcurt Curtain Call, UDX. We hope to see Echo follow in Kaley's footsteps. 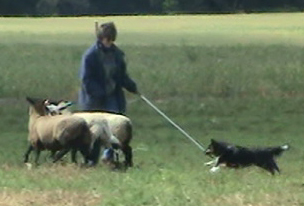 In the fall of 2007 Echo was tested for herding instinct. 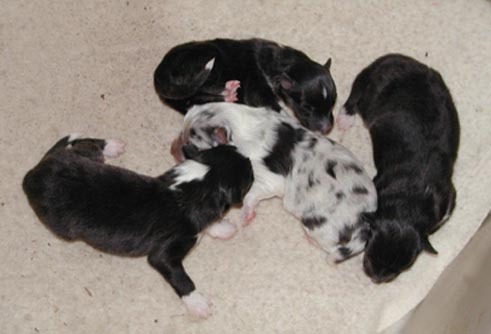 And it looks like this litter really likes to work. 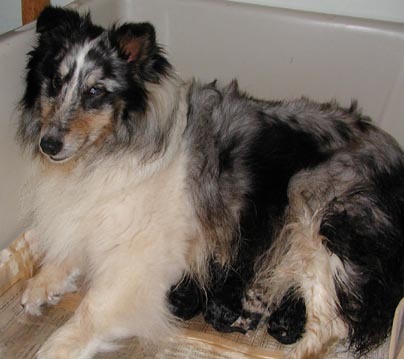 We thank their wonderful owners for giving these Shelties the chance to fulfill their true nature. 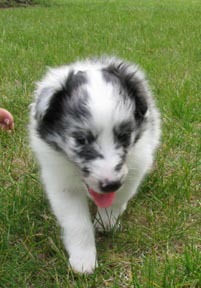 So the next step combines brains with beauty and Echo is bred to the beautiful Ch. Fortunate Son. 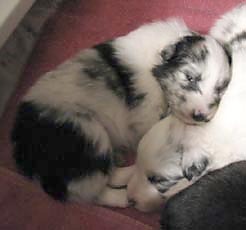 And here we are on April 24, 2008 - a tricolor girl named Devin and a very heavily white factored bi blue boy named Dodger, a tricolor boy named Dawson and a bi blue girl named Deirdre. 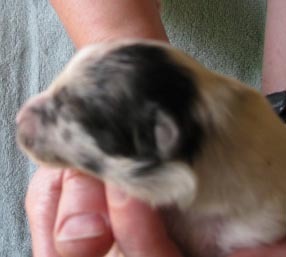 These are our first pictures so you will have to watch us grow. Watch out for the tri girl Devin and the bi blue girl Deirdre who will be on the move in July. Now Deirdre and Devin show how they mature. And Deirdre starts to get out in the world. But both like to sleep on brother Doger. Later we're beginning to grow up and get out. Devin is still thinking Calcurt and dashes past Calcurt Curtain Call UDX until she is held to show her lovely substance as well as soundness. 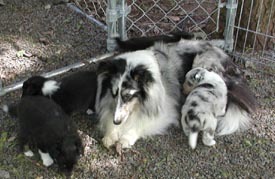 While Deirdre has become Marlee and will be with Shadowood Shelties to possibly try that show thing. But then again she's still a baby so perhaps it is better to sleep. Note she is definitely a bi blue. Remember we have a handsome brother and Dawson continues to develop into an impressive fellow. 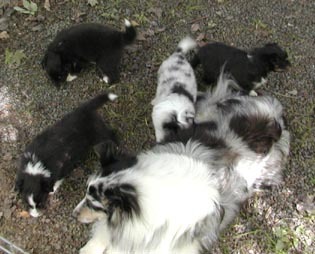 Don't you think there is a lot of quality in this special litter? Check in to see what happens next.